Gold and silver futures declined for a second straight session Thursday. 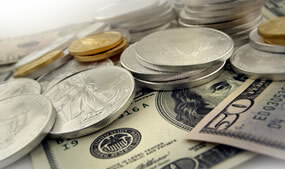 Silver logged a fresh 16-week low, deepening its loss for the month of November. Gold, meanwhile, ended at an about 1-1/2-week low but still eked out a monthly gain. Gold for February delivery declined $9.50, or 0.7%, to settle at $1,276.70 an ounce on the Comex division of the New York Mercantile Exchange. The close is the weakest since Nov. 20. "A strong rally in the U.S. stock market that propelled the stock indexes to record highs Thursday pushed gold and silver prices lower," Jim Wyckoff, a senior analyst at Kitco Metals Inc., said in a report. "The metals ended the futures day session at or near their lowest price levels of the month." Gold futures edged up 0.5% in November after losses of 1.1% in October and 2.8% September. The yellow metal rallied a combined 5.7% in the five months of straight gains prior to September, and is still 10.9% higher so far this year. Silver for March delivery shed 8.7 cents, or 0.5%, to settle at $16.474 an ounce. The settlement is the lowest since Aug. 8, when prices ended at $16.389 an ounce. Silver futures lost 1.3% for the month after inching up 0.1% last month. They are 3% higher on the year to date. January platinum added $1.30, or 0.1%, to $942.50 an ounce, for a 2.5% monthly increase. Palladium for March delivery fell $4.95, or 0.5%, to $1,003.55 an ounce, but also advanced 2.5% on the month. Both metals are higher for the year so far with respective increases of 4.1% and 46.9%. Gold declined $3.65, or 0.3%, to 1,280.20 an ounce. Silver fell 32.5 cents, or 1.9%, to $16.57 an ounce. Platinum declined $5, or 0.5%, to $940 an ounce. Palladium fell $1, or 0.4%, to $1,010 an ounce. In November, silver dropped 1.5% while other London bullion prices posted gains totaling 0.8% for gold, 2.7% for platinum, and 3.4% for palladium. They have year-to-date gains of 10.5% for gold, 2% for silver, 3.6% for platinum and 49.4% for palladium. American Eagle gold coins advanced by 12,000 ounces in November, logging declines of 22.6% from the 15,500 ounces in October and 91.9% from the 147,500 ounces in November 2016. Year to date sales at 259,500 ounces are 72.9% lower than the 956,000 ounces moved during the first eleven months of last year. American Eagle silver coins climbed by 385,000 ounces for the lowest monthly total since December 2016. The tally represents declines of 63% from the 1,040,000 ounces in October and 87.4% from the 3,061,000 ounces in November of last year. 2017 Silver Eagle sales at 17,323,500 are down by more than half, 53.8%, from the 37,461,500 delivered in the January to November period of 2016. American Buffalo gold coins advanced by 2,000 ounces in November, registering declines of 71.4% from the 7,000 ounces in October and 93.2% from the 29,500 ounces in November 2016. Year to date sales at 85,500 ounces are 58.7% lower than the 207,000 ounces sold during the same months last year. Sales of America the Beautiful Five Ounce Silver Bullion Coins climbed by 231,000 ounces with all sales from the newest piece honoring George Rogers Clark National Historical Park in Indiana. Sales were muted in the two previous months. Five-ounce coin sales for the year so far at 737,000 ounces are 48.3% lower than the 1,425,000 ounces sold through the same months in 2016. Anyone notice how the Mint’s sales this year basically sucked? Wonder why that is? Pretty dramatic reductions from last year. Jp, Maybe people are getting tired of the same old stuff and non-interesting commemoratives. Or people would rather put their money in the stock market right now. Still scratching my head wondering why the mint didn’t have a commemorative for the Panama Canal last year. I agree, I was (Zzzzzz…..) over this past years commemorative selections, and coinage in general. I almost passed on the animal crackers 5oz puc, but I did not want to break the 5oz. set. I’m all in on these since day one. Luckily next years 5-5ouncers look like a good bunch. I’ve got money in the market also, but am getting skittish as to how long this can keep going. When this market tanks, it’s really going to hit people hard I think. Yep, you are right, there. What goes up must come down but who knows when.